While I've been on this (technically-imposed) hiatus from blogging I've had quite a few tidbits pile up in my "to blog about" file. So in an effort to catch you up a little I'm enjoying an afternoon of spilling my thoughts. Forgive me for giving you so much at much ... I'm hoping you won't mind. For the past few months I've saved these links to other people's blogs that have oh-so-kindly mentioned their baking or preparing my recipes. And I have to tell you: If imitation is the best form of flattery, the same goes for knowing that people enjoy my cookbooks and find my recipes so approachable. For 19 years I've taken recipe writing so seriously, and never ascribing to "confusion food" (my nickname for "fusion food") or overly complicated recipes, I've always tried to stick to the Italian ideal of Italian food being nothing more than fresh ingredients, simply prepared. That said, these mentions of my recipes really warm me. 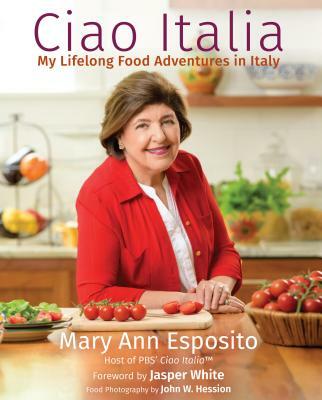 If you're so inclined, click below and see what others are doing with Ciao Italia™ recipes. :: Over at Musings on an Ordinary Life, June has a nice post about the trials and tribulations of using gluten-free flour ... but she also shows some lovely pictures of a very successful batch of biscotti from Ciao Italia Tuscany. Beautiful biscotti, June! Thank you for sharing, and keep up the good work. :: My recipe for Pane di Pasqua di Signora Condello, or Easter bread, was a happy find for blogger Andrea at BellyGlad. Andrea was absolutely correct in her post: Many cultures celebrate Easter with a bread baked with an egg in it -- a sign of life and fertility. :: The Zeppole di San Giuseppe photos at Sticky, Gooey, Creamy, Chewy are scrumptious looking, and make me feel so good to know that this recipe lives on thanks to baking bloggers like Susan. (You can find that recipe on my Web site, or in Nella Cucina. I still have a healthy list of more great folks writing about their kitchen adventures with Ciao recipes. I'll stop for now, though. Let me just send a huge grazie to everyone who holds the work that the Ciao Italia™ team does in such high esteem.